The apartment is spacious, bright and very comfortable. There are three bedrooms, a large living room, a kitchen, two bathrooms and a large terrace from where to enjoy the sea view. It can accommodate six people and each couple will have their own room. There are two rooms with twin beds and a room with a double bed. On request I can add a cot. The large living room has a dining table and chairs, a couch, dresser with everything you need to set the table and the TV. The living room is connected to the kitchen with an opening serving hatch. The kitchen is equipped with everything you need to cook there is also an electric oven, a toaster and a kettle. There are two bathrooms, the larger one with shower and washing machine, the smaller one with a bathtub, both have a window to the outside. From the balcony and the large terrace there is a beautiful view of the sea. You can dine outdoors, there are table and chairs. If you want on the terrace, you can relax on the sun loungers. I offer a free wi-fi, is not very powerful but it is enough for a normal Internet browsing. 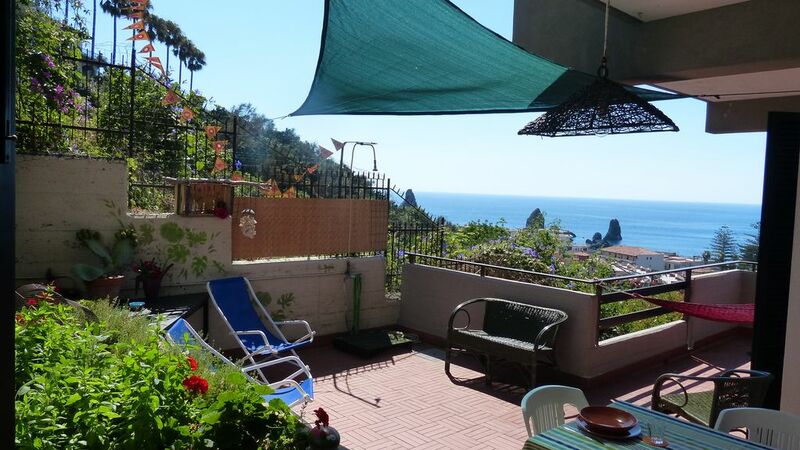 The apartment is located in a quiet residence and located a few steps from the sea (about 300 meters) and from the center of Acitrezza (500mt). In the village of Acitrezza are all necessary facilities (pharmacy, bank, supermarket, newsstand) and also restaurants, clubs and bars. The appartment was really well appointed and stocked. We were given the most friendly welcome complete with still warm arancini for our supper and everything ready for breakfast the next day. And when I had severe tooth ache Clelia met us and went to the dentist with me and translated. Her kindness and hospitality were both outstanding and exceptional. Would highly recommend. We stayed for 3 nights at this lovely apartment. The location is great, with easy access to the town and to the sea front. Clelia was a lovely host, who could not have been more helpful. Highly recommended. Clelia provides the best accommodation ever on the hillside between Acicastello and Acitrezza. Everything is perfect: comfortable beds and sitting space, well provisioned kitchen, and a good amount of space. The lovely patio is comfortable and has a wonderful view over the sea. Clelia is the best host ever! She is warm, kind, thoughtful and generous. She had hot coffee ready for us upon arrival, and gave us suggestions for places to eat in Acitrezza and for Catania. Parking was easy and the internet was good. We completely loved our stay in her lovely apartment. Beautiful, clean and great location! We spent a week here in June and it could not have been better. The apartment is spacious and well maintained. The highlight is the terrace that looks out on the town and the Mediterranean. We ate out on the terrace almost every day and made great use of the well stocked kitchen. Easy walk down the hill to town and a short drive to Catiana, Taromina and Mount Etna. Great stay in comfortable, spacious, homely apartment. We received a warm welcome from Clelia when we arrived at the apartment as well as a welcome pack including water, beer, fruit and chocolate cake! We were 2 couples sharing the 3 bed, 2 bathroom apartment. There was also ample parking for our 2 cars as there was a garage and on street parking in the private, gated complex. It was nice to have 2 bathrooms with toilet & shower facilities so we had our own space. The apartment was very spacious, comfortable and homely with some nice personal touches and local craft work. There was plenty of lovely crockery and glasses and pots and pans etc so we could prepare more than a cold spread. It was also nice to have store cupboard ingredients available, olive oil etc, so we didn't have to stock up on things we'd not use, but we also left things for the next person to use, pay it forward! The outside areas had lovely views across the village to the sea and from the front you could see the Castle at Aci Castello and the bigger ships beyond. It was especially nice in the evenings as the sunset illuminated the tiled roof tops. Very relaxing with a glass in your hand! We ate all our meals out here and used the fresh herbs growing in the stunning border. Clelia also gave us advice on trips and places to eat etc, these were all great recommendations. She also let us know she was available to message if we had any problems or questions. Location suited us as it was a short stroll to the village and seafront but in a quiet neighbourhood. There is a very steep climb for the last couple of minutes back up to the apartment but this was a small price to pay for the views and location. It was well positioned for our trips to Etna, Taormina, Enna and Catania and an pleasant trip along the coast up from our previous night in Siracusa. There was a large supermarket on the road into Catania, about 5 km away, or provisions available in the village. Aci Terezza was a bustling seaside resort with a good choice of places to eat, drink and people watch. We would thoroughly recommend this apartment and it's friendly, welcoming host! Det var en rigtig skøn lejlighed - dejlig indretning stor og dejlig terrasse og alle nødvendige faciliteter. Dog kunne vi ønske et sæt håndklæder yderligere. Og vi fik rigtig dejlig modtagelse - der var drikkevarer og mad til os, da vi ankom kl. 21,00. Det var bare dejligt. Vi kan varmt anbefale denne lejlighed. Acitrezza originally a small fishing village has not lost all its seafaring vocation and in the harbor area, which is still the center of the country, there are hundreds of small boats and if you ask some old fisherman takes his boat to visit the cliffs and the island Lachea. At the port you can also rent small motor boats, also you can rent canoes and paddleboats. The costs of this whole area is rocky but access to the sea is easy, facilitated by the many beaches and sun terrace offering sun beds and umbrellas for a few Euros. The city of Catania is located a few kilometers. The apartment is in a perfect location for exploring the east coast of Sicily.